Warren Gamaliel Harding, the son of a doctor, was born in Blooming Grove, Ohio, on 2nd November, 1865. A journalist, Harding and his wife, Florence Kling DeWolfe took control of the Marion Daily Star in 1891. He joined the Republican Party and became a director in several local companies. Harding was elected state senator (1899-1902), lieutenant governor (1903-04) and U.S. senator (1915-1921). Although his career was undistinguished, when the three leading candidates were deadlocked, Harding was asked to be the Republican presidential candidate in 1920. His isolationist foreign policy was popular with the electorate and he was voted into office by the widest popular margin in history. Harding managed to persuade Congress to pass the highly protective Fordney-McCumber Tariff and measures to restrict immigration. In March 1921 Harding appointed Albert Fall as Secretary of the Interior. Soon afterwards he persuaded Edwin Denby, the Secretary of the Navy, that he should take over responsibility for the Naval Reserves at Elk Hills and Teapot Dome. Later that year Fall decided that two of his friends, Harry F. Sinclair (Mammoth Oil Corporation) and Edward L. Doheny (Pan-American Petroleum and Transport Company), should be allowed to lease part of these Naval Reserves. Attempts were made to keep this deal secret but rumours began to circulate when it became known that Albert Fall was spending large sums of money. On 14th April, 1922, the Wall Street Journal reported that Fall had leased Teapot Dome to Harry F. Sinclair. Harding defended Fall by claiming that "the policy which has been adopted by the Secretary of the Navy and the Secretary of the Interior in dealing with these matters was submitted to me prior to the adoption thereof, and the policy decided upon and the subsequent acts have at all times had my entire approval." Warren Gamaliel Harding died suddenly on 2nd August, 1923, in San Francisco, and was replaced by his vice-president, Calvin Coolidge. 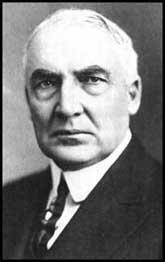 President Harding was one of the most kindly and amiable of men. It seemed to me that instinctively he reposed too much confidence in his friends, and that he shrank from giving hurt. That generous judgment did not account for the developments of the following months which shocked the American people. In the Senate he had been a dependable conservative in all of his thought and his votes. In the White House he symbolized Ohio political machine politics. There came to Washington on the heels of this new administration a curious crew, with an amazingly blunted, repulsive conception of public service and the responsibilities of public office. not be expected to have a far-sighted view of public service, combining qualities of unselfishness and high devotion to public trust. It was not long before Washington, the most sensitive of all American cities to scandal, buzzed with gossip. taken by President Roosevelt, who caused to be instituted a study to ascertain the existence and location of eligible areas, as a result of which President Taft in 1909 withdrew the tracts in question from disposition under the public land laws. These areas were thus set apart with a view to keeping in the ground a great reserve of oil available at some time in the future, more or less remote, when an adequate supply for the Navy could not, by reason of the failure or depletion of the world store, or the exigencies possibly of war, be procured or could be procured only at excessive cost; in other words to ensure the Navy in any exigency the fuel necessary to its efficient operation. From the time of the original withdrawal order, private interests had persistently endeavored to assert or secure some right to exploit these rich reserves, the effort giving rise to a struggle lasting throughout the Wilson administration. Some feeble attempt was made by parties having no claim to any of the territory to secure a lease of all or a portion of the reserves, but in the main the controversy was waged by claimants asserting rights either legal or equitable in portions of the reserves antedating the withdrawal orders, on the one hand, and the Navy Department on the other. In that struggle Secretary Lane was accused of being unduly friendly to the private claimants, Secretary Daniels being too rigidly insistent on keeping the areas intact. President Wilson apparently supported Daniels in the main in the controversy which became acute and Lane retired from the cabinet, it is said, in consequence of the differences which had thus arisen. The reserves were created, in the first place, in pursuance of the policy of conservation, the advocates of which, a militant body, active in the Ballinger affair, generally supported the attitude of Secretary Daniels and President Wilson. They too became keen on the report of the impending lease of Teapot Dome. Failing to get any definite or reliable information at the departments, upon diligent inquiry, Senator Kendrick of Wyoming introduced and had passed by the Senate on April 16, 1922, a resolution calling on the secretary of the interior for information as to the existence of the lease which was the subject of the rumors, in response to which a letter was transmitted by the acting secretary of the interior on April 21, disclosing that a lease of the entire Reserve No. 3 was made two weeks before to the Mammoth Oil Company organized by Harry Sinclair, a spectacular oil operator. This was followed by the adoption by the Senate on April 29, 1922, of a resolution introduced by Senator LaFollette directing the Committee on Public Lands and Surveys to investigate the entire subject of leases of the naval oil reserves and calling on the secretary of the interior for all documents and full information in relation to the same. Commission had just reported that, owing to conditions prevailing in the oil fields of Wyoming and Montana, the people of my state were paying prices for gasoline in excess of those prevailing anywhere else in the Union.